The New York Times revealed in an A10 story of Sunday's edition that Secretary of State Mike Pompeo is, in fact, an evangelical Christian. In an article headlined "The Rapture and the Real World: Mike Pompeo Blends Beliefs and Policy," writer Edward Wong devoted more than 1,400 words to recapping Pompeo's comfort with discussing his religious views and how that's "increasingly raised questions about the extent to which evangelical beliefs are influencing American diplomacy." American evangelicals who supported Mr. Trump’s embassy move might also approve if Israel annexes part or all of the West Bank. After Mr. Trump formally recognized Israel’s sovereignty over the Golan Heights in a meeting on Monday with Prime Minister Benjamin Netanyahu, many conservative Israelis said they are hopeful that annexing part of the West Bank will be next. Then there is the question of what an Israeli-Palestinian peace plan, as drawn up by Jared Kushner, Mr. Trump’s adviser and son-in-law, will recommend for the disputed territories of Jerusalem and the West Bank. Martin Indyk, a former assistant secretary of state for Near East affairs, noted the evangelical influence on the Trump administration in saying he doubted that the peace plan would propose ceding any Israeli-occupied territory in the West Bank to Palestinians. Nor was it likely to provide a route to Palestinian sovereignty, Mr. Indyk said. "In the view of evangelicals, that is the land that God gave to the Jews," he said. "They’re strongly opposed to any territorial concession there. If there is any of that in the plan, I think there will be strong evangelical opposition to it." Mr. Trump’s decision in December 2017 to move the American Embassy was intended to please evangelical voters in the United States, as well as some Jews. Mr. Netanyahu has embraced evangelical support for his right-wing policies, and sees evangelicals as more reliable American allies of Israel than liberal American Jews. Of note to the Times was Pompeo telling the pro-Israel group AIPAC, "As secretary of state and as a Christian, I’m proud to lead American diplomacy to support Israel's right to defend itself," and also sharing the anecdote of Christian Tibor Baransk, who saved thousands of Jews in Hungary during the Holocaust. Noting it is a "policy popular with conservatives," the article reported the day after Pompeo spoke to AIPAC, he announced an expansion of the Mexico City policy of refusing funding to foreign nongovernmental organizations that give money to foreign groups that perform abortions. Wong also recapped Pompeo becoming a Christian while a student at West Point, telling a reporter the Bible informs his actions—"The reporter noticed an open Bible in his office, with a Swiss Army knife marking his place at the end of the book of Queen Esther"—and speaking about the rapture. Pompeo also got hit for often calling the Islamic Republic of Iran by its full name and telling a Christian group about the threat posed to them by radical Islamic terrorists. "Mr. Pompeo has made Iran a signature issue, blaming it for stirring unrest in the Middle East," Wong wrote, not pointing out Iran is the largest state sponsor of terrorism in the world. 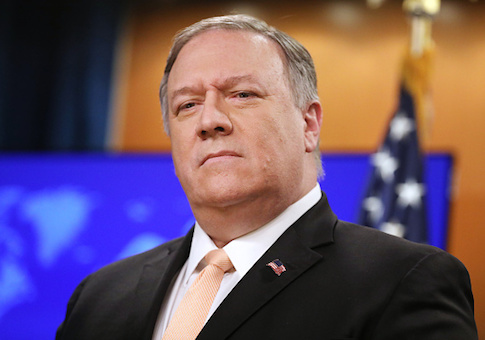 Wong did write Pompeo has "defended the rights of Muslims oppressed by some Asian nations:"
He has criticized Myanmar for its ethnic cleansing of Rohingya, though he has declined to describe it as genocide. And Mr. Pompeo has denounced China for its detentions of one million or more Muslims. Wong formerly tweeted with the handle @ComeradeWong. He did not receive responses from the State Department for his piece. The piece follows a New York Times Magazine article by Nathan Thrall last week about the growing embrace by the political left of the anti-Israel Boycott, Divestment, and Sanctions (BDS) movement. The magazine did not disclose Thrall's work as executive director of the Arab-Israeli Project at the left-leaning International Crisis Group (ICG), nor his prior criticisms of Israel and reference to BDS as potentially "a leading cause for advocates of free speech." The ICG received $4 million last year from Qatar, which also serves as the largest funder of Hamas, the Palestinian terrorist group governing the Gaza Strip. This entry was posted in Politics and tagged Israel, Media, Media Bias, Mike Pompeo, New York Times, Qatar, State Department, Trump Administration. Bookmark the permalink.